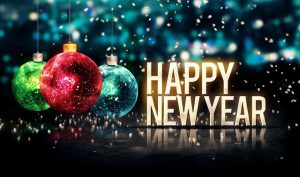 New Year’s Day, also called simply New Year’s or New Year, is observed on January 1, the first day of the year on the modern Gregorian calendar as well as the Julian calendar.In pre-Christian Rome under the Julian calendar, the day was dedicated to Janus, god of gateways and beginnings, for whom January is also named. As a date in the Gregorian calendar of Christendom,New Year’s Day liturgically marked the Feast of the Naming and Circumcision of Jesus, which is still observed as such in the Anglican Church and Lutheran Church.In present day, with most countries now using the Gregorian calendar as their de facto calendar, New Year’s Day is probably the most celebrated public holiday, often observed with fireworks at the stroke of midnight as the new year starts in each time zone. 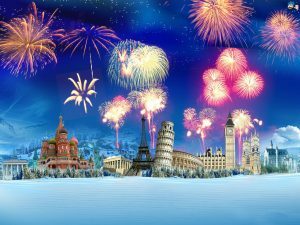 Other global New Year’s Day traditions include making New Year’s resolutions and calling one’s friends and family. New Year’s is one of the oldest holidays still celebrated, but the exact date and nature of the festivities has changed over time. It originated thousands of years ago in ancient Babylon, celebrated as an eleven day festival on the first day of spring. During this time, many cultures used the sun and moon cycle to decide the “first” day of the year. It wasn’t until Julius Caesar implemented the Julian calendar that January 1st became the common day for the celebration. The content of the festivities has varied as well. While early celebrations were more paganistic in nature, celebrating Earth’s cycles, Christian tradition celebrates the Feast of the Circumcision of Christ on New Year’s Day. Roman Catholics also often celebrate Solemnity of Mary, Mother of God, a feast honoring Mary. However, in the twentieth century, the holiday grew into its own celebration and mostly separated from the common association with religion. It has become a holiday associated with nationality, relationships, and introspection rather than a religious celebration, although many people do still follow older traditions. What People Do At New Year ? #Making resolutions or goals to improve one’s life. #Common resolutions concern diet, exercise, bad habits, and other issues concerning personal wellness. A common view is to use the first day of the year as a clean slate to improve one’s life. #A gathering of loved ones: Here you’ll typically find champagne, feasting, confetti, noise makers, and other methods of merriment Fireworks, parades, concerts. #Famous parades include London’s New Year’s Day Parade and the Rose Parade in Pasadena, California. Superstitions concerning food or visitors to bring luck. #This especially includes circle-shaped foods, which symbolize cycles. The reasoning behind superstitions is that the first day of the year sets precedent for the following days. A common superstition specific to New Year’s Day concerns a household’s first visitor of the year—tradition states that if a tall, dark-haired stranger is the first to walk through your door, called the First Footer or Lucky Bird, you’ll have good luck all year. Also, if you want to subscribe to superstition, don’t let anything leave the house on New Year’s, except for people. Tradition say’s: don’t take out the trash and leave anything you want to take out of the house on New Year’s outside the night before. If you must remove something, make sure to replace it by bringing an item into the house. These policies of balance apply in other areas as well—avoiding paying bills, breaking anything, or shedding tears.